Tonight I began work on what should be a fairly quick project. The pattern belonged to my grandmother and is dated 1960. The shape is truly simple — nothing more than a front, two backs, and a neck facing. The sleeves are cut on and the waist is shaped by a belt, or not at all. I’m using a rather awful fabric, discovered at the thrift store. There really isn’t anything else you could make with this fabric. The pattern is single size, 10/12. 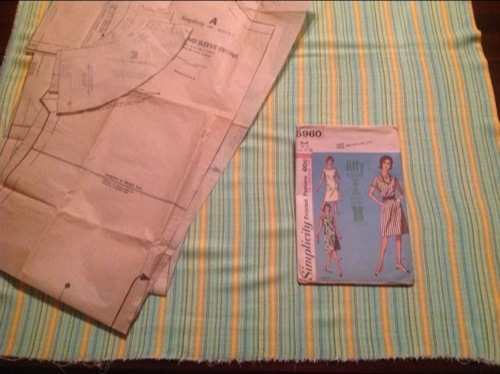 My measurements are size 14 according to the envelope, but the pattern seems to fit okay as is. Though it’s hard to tell in tissue paper…I do usually end up taking things in when I size them based on measurements. Either I measure myself wrong, or maybe I just like tight clothes? Anyways, I plan to alter the pattern just ever so slightly, mostly to lower the bust dart, which I must do on every commercial pattern.